The Asphalt Pavement Alliance (APA) has announced the seven winners of its 2014 Perpetual Pavement Awards. The award is presented to state transportation departments and local agency road owners for well-performing asphalt pavements that are at least 35 years old with proven high-quality structural designs. To earn the award, the pavement must not have suffered a structural failure, and it should have an average interval between resurfacing of no less than 12 years. The road must demonstrate the characteristics expected from a long-life, Perpetual Pavement design: excellence in design, quality in construction, and value for taxpayers. Engineers at the National Center for Asphalt Technology (NCAT) located in Auburn, Alabama evaluated the nominations and validated the results for the seven award winners. 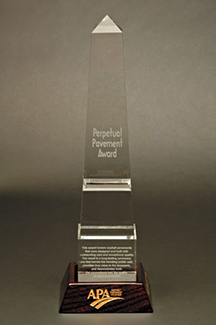 Since the Perpetual Pavement Award was first presented in 2001, 100 pavements in 30 U.S. states and one Canadian province have been honored with the award. • Alabama Department of Transportation for a 5.54 mile section of the Abbeville Bypass in Henry County. This is the sixth Perpetual Pavement Award for ALDOT. • Arkansas State Highway and Transportation Department for 2.54 miles of US 71 in Sevier County from milepost 1.16 to 3.70. It is the fifth Perpetual Pavement Award for AHTD. • Florida Department of Transportation’s SR 44 in Lake County from the intersection of CR 437 to the Volusia County line — between milepost 7.82 and 24.08. This is the fifth Perpetual Pavement Award for FDOT. • Indiana Department of Transportation for a 14 mile stretch of US 31 in Fulton and Miami Counties, from 0.5 miles south of SR 16 to Old US 31. US 31 is the first Indiana pavement to win a Perpetual Pavement Award. • Minnesota Department of Transportation’s four-lane SR 47. This 4-mile project extends from CSAH 2 in Columbia Heights, Minn., to 73rd Avenue North in the city of Fridley. MnDOT has had 13 pavements recognized with the Perpetual Pavement Award, more than any other state or agency. • Pennsylvania Department of Transportation for the nearly 3-mile long segment of SR 2005, also known as Raccoon Run Road, in Allegheny County. PennDOT has earned four Perpetual Pavement Awards. • Tennessee Department of Transportation’s 3.5 miles on SR 40 in Polk County from 0.2 miles east of US 68 in the city of Ducktown to the North Carolina state line. This is the 10th Perpetual Pavement Award earned by TDOT. The Asphalt Pavement Alliance is a partnership of the Asphalt Institute, National Asphalt Pavement Association and the State Asphalt Pavement Associations. For more information about the 2015 awards click here.